The year is almost over and multi signature wallets have finally arrived in what was said to be the year of multisig. Over the last many months I have been reading about this technology and eagerly looking to find a service that would help us easily use and manage such an account. Below are all of the easy to use options that I know of and have experimented with. If you don’t have a clue what multi signature transactions are, start here, but the basic idea is having to use more than one private key to sign a transaction to spend funds from a given account. This type of account can be shared by multiple users but also allows for one person to have to sign and manage 2 of 3 keys adding a security layer for individual users and not necessarily having to have multiple people sign off on a transactions. BitGo was the first to bring a multisig product to market and in March of this year started offering enterprise grade accounts to business and bitcoin enthusiasts. BitGo does make their wallet free for the general public but the tools and feature sets are targeted at businesses with a need to secure large bitcoin holdings. Implementing a wallet like this is easy but a number of steps must be taken to set up the account properly. The wallet should require your company to have a technical/security officer who would implement the account and secure the relevant data and master keys. This person would have no signing authority but would play a critical role in keeping this information backed up and safe. In addition, some amount of training would likely be needed for the staff that does have signing authority: your accountants, office managers, and CFO. If this sounds like your use case, this is the best and most widely used professional account on the market. In the end, I did not find this to be the best tool for our small organization but I have retained a security officer who will help us implement this wallet in the coming year. Coinbase announced its Vault service earlier this year and on Oct 29th announced that this system was now operating with multi signature technology under the hood. The blog post also noted a new feature of this wallet to allow users to control their own private keys; specifically the ones used in a multisig agreement. While the wallet is still primarily geared towards individual users, the multisig vaults can be set up between a group of Coinbase users in a 2 of 3 or 3 or 5 configuration. This type of set up make funds easily shared with family members and provides complete control in the case that a family member passes on. BitPay announced in July that its open source multisig wallet Co-Pay was available to the public. The feature set of this wallet look nice and this appears to be geared towards large organizations and institutions who need consensus spending. With the strong warning that this wallet is still in beta and should not be used with large amounts of funds leads me to not take it to seriously just yet. Multisig for all, last but certainly not least is the multisig wallet offered by Coinkite. 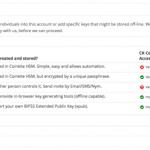 Just announced a week ago, Coinkite combines HMS bank grade security in its web wallet with powerful multisig tools to create and store private keys. This wallet operates much like the Coinbase offering above with a few twists that give it the maximum amount of options and configurations. An account can be set up with up to 15 users (the limit set by the protocol), so if a 7 of 12 agreement is what your organization requires, you can have an account set up this way. The major flexibility comes in that you don’t have to have a Coinkite account to enter in to a multisig agreement with others who do. You can provide your own keys from any supported multisig wallet, or Coinkite can generate the key for you and still leave the security and storage of that key up to you. The simplest option is to let Coinkite create and host the key in your web wallet. They also allow the option to protect that key with a password so that even Coinkite could not access your funds with your keys. All four options are presented to each participant after being invited to the account and will allow any group of individuals to enter in to the wallet regardless of their knowledge of multisig and private key management. The user experience on the website could be a bit better but giving users access to multisig wallets that are easy to use and setup is why we are reconstituting our funds behind multisig using Coinkite’s service. This account shown below is for our homeless outreach efforts in the Bay area and soon Pensacola, stay tuned for an announcement about that in the next few days. The bottom line with this technology is that it is a huge step forward in stopping funds from being easily stolen. But keep in mind that all the offerings above offer no insurance with them, there is no FDIC and this is still the wild west of bitcoin. If you read the Terms of Service carefully, you will find that you assume complete responsibility for the wallets listed here and no one from customer service can reset passwords or anything of the sort if you encounter a problem. In the coming years I think that most of this will be baked in to the wallet you use and you won’t get much of a chance to see the nitty gritty happening behind the scenes. If you are still curious about what all this all looks like and would like to jump in and make your first multisig account, sign up for a free Coinkite account here or let me know what you think of the other wallets offered in the comments below. Note: Armory, Bitcoin Core, and others offer multisig accounts in their software based wallets but none are really easy for the average user to set up. Roger Ver to match $10,000 of bitcoin donations for AntiWar.com, again! Decentralize All the Homeless Outreach!